We were very pleased to be joined this fall by international accessibility consultant Sina Bahram for a weeklong workshop exploring opportunities for maximizing visitor accessibility for interactive digital experiences. We’ve been collaborating with Sina, founder of Prime Access Consulting, since our work on the NSF-sponsored Creating Museum Media for Everyone (CMME) project. CMME is a collaborative project involving the Museum of Science (Boston), the WGBH National Center for Accessible Media, Ideum, and Audience Viewpoints. 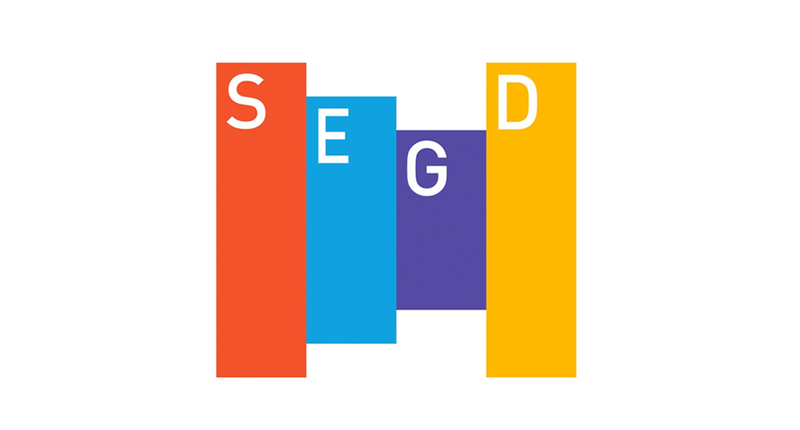 It was designed to further the museum field's understanding of ways to research, develop, and evaluate digital interactives that are inclusive of all people. 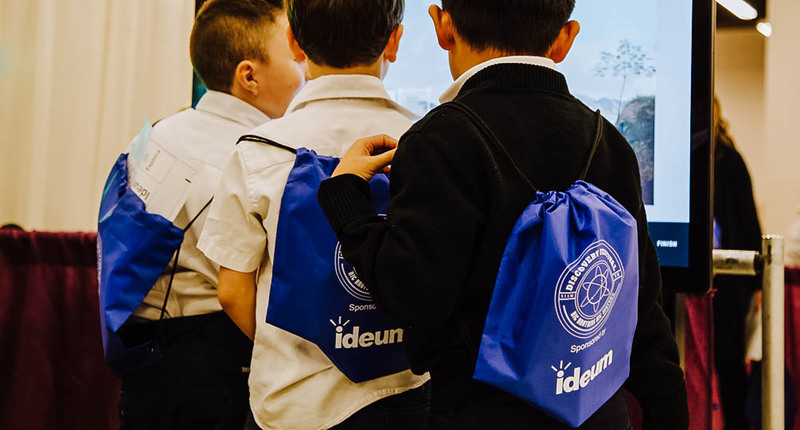 As part of Ideum’s Open Exhibits initiative, CMME embraces principles of inclusive design in the development of interactive experiences, such as those created for multitouch tables and touch walls. Most critically, an effective inclusive design approach informs development from the very first conception of a new experience, rather than adding accessibility features once exhibits have already been built. The approach also seeks to create experiences in which all audiences have comparably rich and engaging experiences. 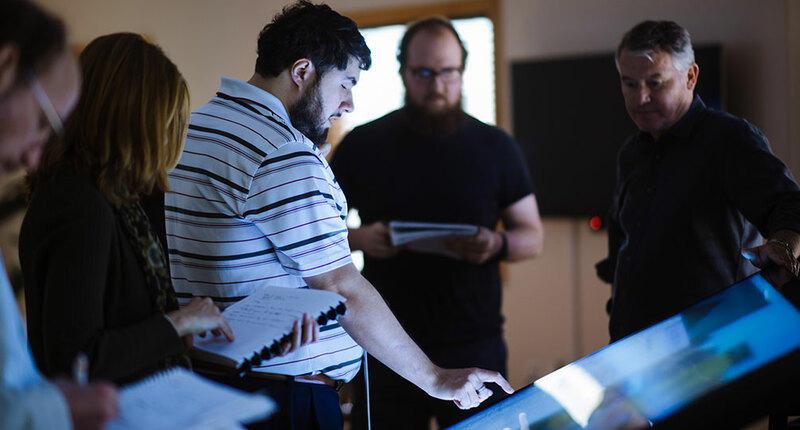 Our workshop with Sina focused on enhancing and expanding those audio accessibility features for a new suite of exhibits we’re developing for the Visitor Center at Hoover Dam. 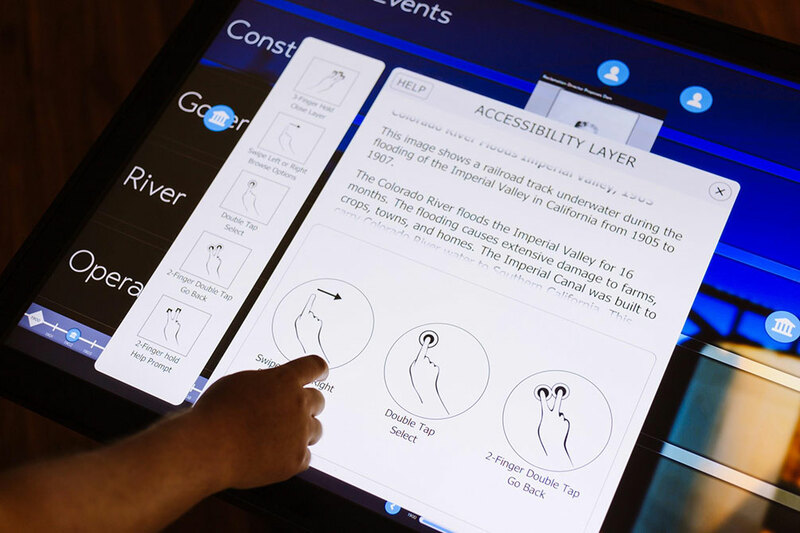 These multitouch exhibits give visitors new ways to explore a wide range of content, including onscreen text, images, videos, and 3D models depicting the history, technology, and environmental aspects of the Dam. Our broader aim is to continue experimenting with ways of ensuring that all the experiences we create are open and engaging for everyone. This means not only working on specific solutions like those described above, but committing to adopt the principles of inclusive design in everything we do. It’s important to remember that although much of the discussion of accessibility focuses on non-sighted people or people with low vision, we must also maintain awareness of people with other sensory, motor, or cognitive impairments. Involving people from these communities throughout the conceptualization, design, and evaluation process would be an important step for our field. 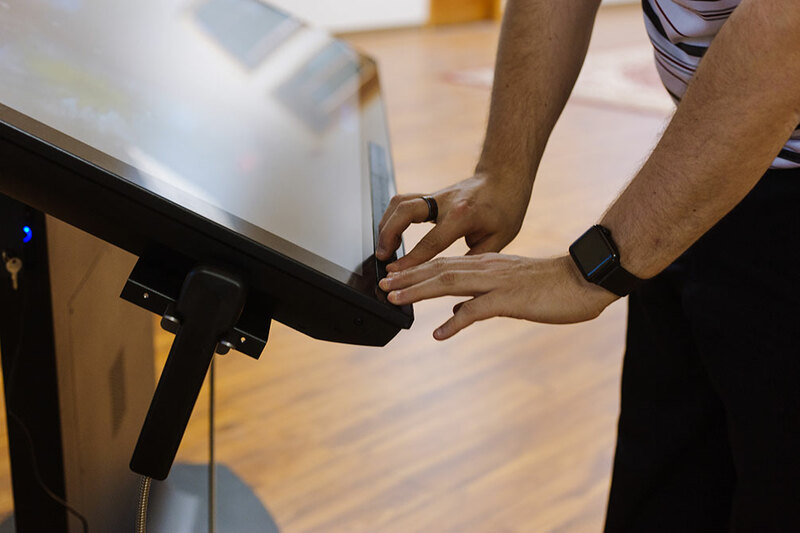 More fundamentally, although exciting new technologies and approaches frequently appear, many venues still do not meet basic access standards for entry or exhibit use. 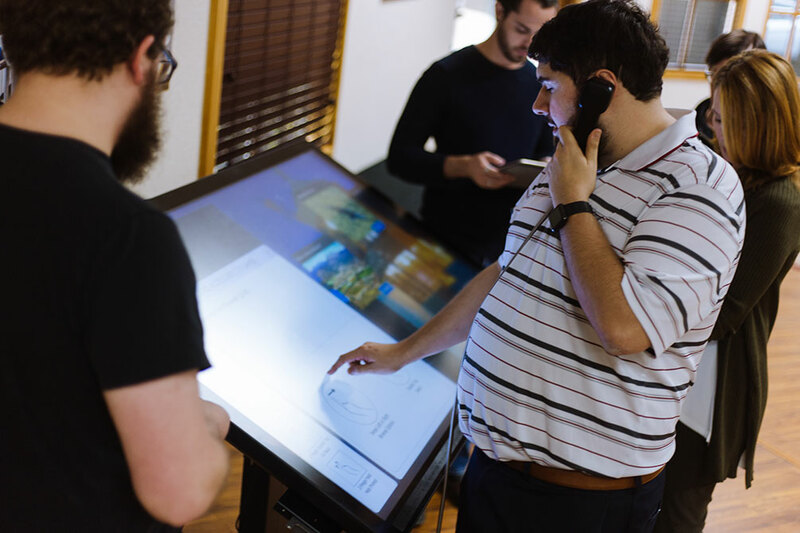 Experience designers must use their expertise to influence the field for a truly comprehensive approach to usability—one that seeks inclusive design solutions from a person’s first awareness of a new exhibit to their ponderings and reflections on the way home. Look for our upcoming white paper on inclusive design for digital exhibits early in 2018. 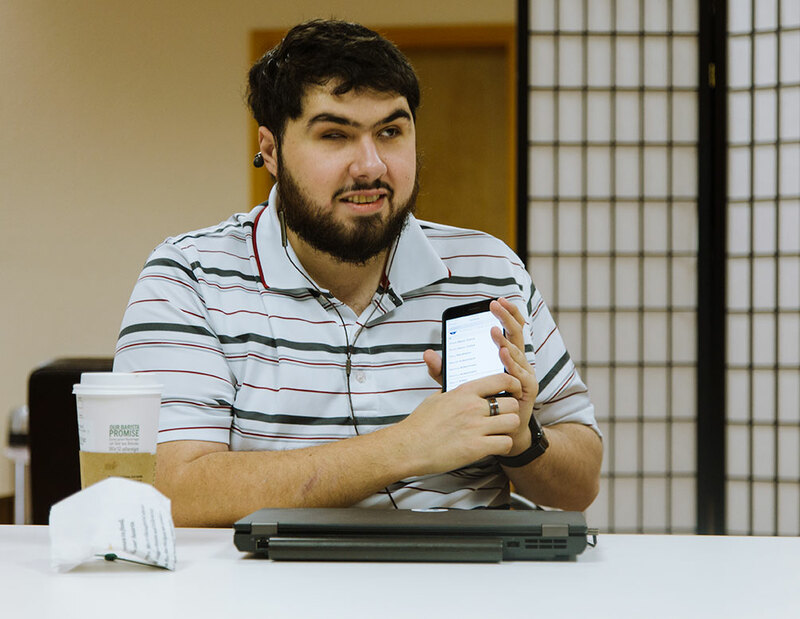 Sina Bahram researches technologies for inclusive design. A Braille strip alerts visitors to accessibility features. Sina experiments with a gesture-driven audio prototype.